1080° Snowboarding is a title that divided gamers when it was first released. Here was a game that mixed Nintendo's usual penchant for killer gameplay with a more serious subject matter than the company was used to dealing with. 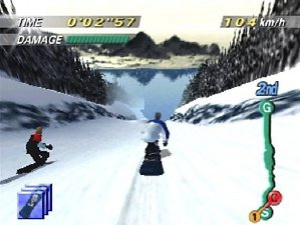 It got lazily compared to fellow N64 stable mate Wave Race and came out looking worse, because it was a much harder game to get to grips with and was more sober and unassuming. 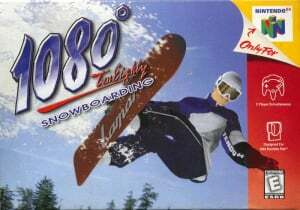 It could be argued that 1080 was created in response to the flood of snowboarding games available at the time, but Nintendo wasn't just cashing in with this game – it totally blew away the likes of Cool Boarders on the Playstation and contained a stunningly realistic representation of snowboarding. Unlike a lot of snowboarding games, whose half pipe modes are their only real thrill, the 1080's downhill races and time trials are great. The tracks are treacherous, and each is different from the last. Moguls, giant drops, and impossible curves are littered throughout. When time limits are imposed, it's not with occasional banners and 45-second bonuses, but through slalom flags, each of which doles out a two-second bonus. While initially this is frustrating, it does add tension to the trial, and it's a much better use of slalom flags than simply throwing you out for missing some predetermined and arbitrary number. The visuals in 1080 are pretty special, and although they obviously don't look that hot by today's standards, at the time of publication they were undoubtedly cutting edge. 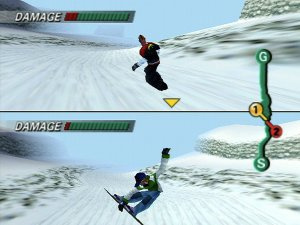 The snowboarders themselves display a wonderful degree of animation and each turn and jump looks just as it should; compared to rival games it's a cut above and no mistake. There are five modes to tinker with here. Championship is (as you might expect) the most important mode and is the one you'll be spending the most time with. Time Attack does what it says on the tin, as does 2P Versus. Trick mode is all about showing off on the slopes and Practice…well, I think it speaks for itself. As you progress in the championship you unlock new difficulty levels and courses. This mode works well for a time, but it won't be long until you've zipped through and seen all the game has to offer. From this point on you have the (considerable) appeal of the two player mode to keep you entertained, but if you lack companionship then you're stuck with improving your times or pulling off tricks, both of which get dull quickly. This is where 1080 falls down hardest. There just isn't enough content here, which is a crying shame as this is one of the best simulations of snowboarding ever produced. As it stands, it's still a worthwhile purchase and if you know you can get a friend involved then you'll spend countless hours racing each other through that magical powder, but if you're flying solo then you might want to consider something with a bit more meat on the bone. I still believe that this was overrated, and at 8/10 is a bit too high, methinks. I'm sure that snowboarding fans will get a kick out of it though. It takes a while to get into, but soon sparkles with the characteristic Nintendo promise. Put the effort in, and you'll be in the knowledge that you've wisely used 1,000 points. This was dissapointing for me, because 1080 Avalanche for Gamecube is my favorite snowboarding game of all time. It's not a bad game by any means- but the controls for pulling off tricks are pretty unintuitive. The combinations you have to do just to do a simple grab trick are just insane. It's a must have for snowboarding fans, but you can get the better 1080 Avalanche for Gamecube for the same price nowadays. I never really got into this game, but an 8/10 seems a little high. A 7/10 is more like it. I'm gonna try to find a copy of 1080 Avalanche for Gamecube somewhere. 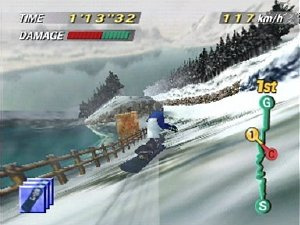 I absolutly hate snowboarding, but i remember to enjoy this one on the original n64 before we sold it. so i might going to get it. $200 for this with club nintendo coins gaiz everybody go crazy for it! I think it will be worth £4.50 in the promotion. Tempted to pick this up with Waveracers. So many fond memories of the N64 that i never owned myself. Making up for it by buying all these digital downloads.